If you ever wondered what to do with all those patches bought from vacation destinations long ago then look no further than this stunning Mary Katrantzou ‘Dixiecult’ dress Diane Kruger wore to the season 2 premiere of The Bridge last night. From the fall 2014 collection this shows a huge departure from the mesmerizing digital print designs Mary Katrantzou is renowned for and Kruger’s sartorial prowess makes her the ideal candidate to show it off. Here’s another look at some of those patches including more road signs and the intricate double braid hairstyle that is so deceptively simple from the front. And here is Kruger looking super adorable with co-star Demián Bichir and it is this partnership I am looking forward to seeing again when The Bridge returns tomorrow (July 9) on FX. 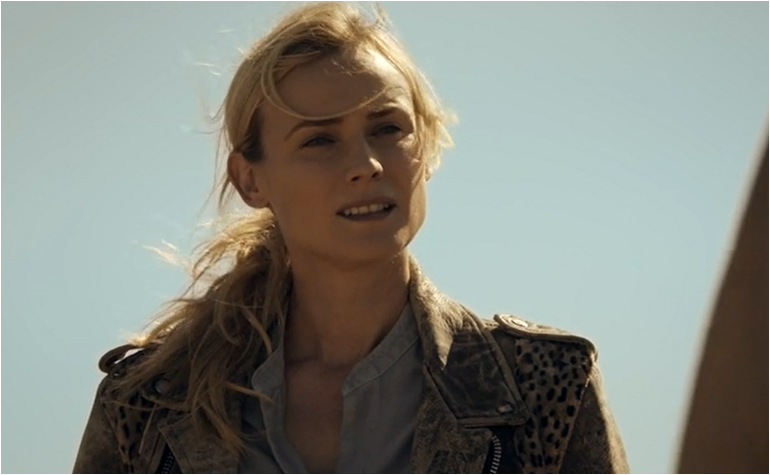 Season 1 of The Bridge comes to an end this week and while Diane Kruger’s red carpet and street style is often a point of discussion here at TV Ate My Wardrobe, it’s the costuming of her character Sonya Cross that I will be taking a look at today. Sonya isn’t the only one who has a specific look on The Bridge and Steven Linder’s smart rodeo wear adds another layer of intrigue to his character. This article discusses the events of The Bridge prior to the finale. While it has never been explicitly mentioned in dialogue on The Bridge, Sonya has Asperger’s syndrome and what she wears is a direct reflection of that. The one item that Sonya wears each week is the leather jacket in the above photo and it’s a fascinating item as it’s completely different from everything else she wears. This jacket has so much detail that in week 12 I’m still noticing embellishments that I haven’t picked up on before. 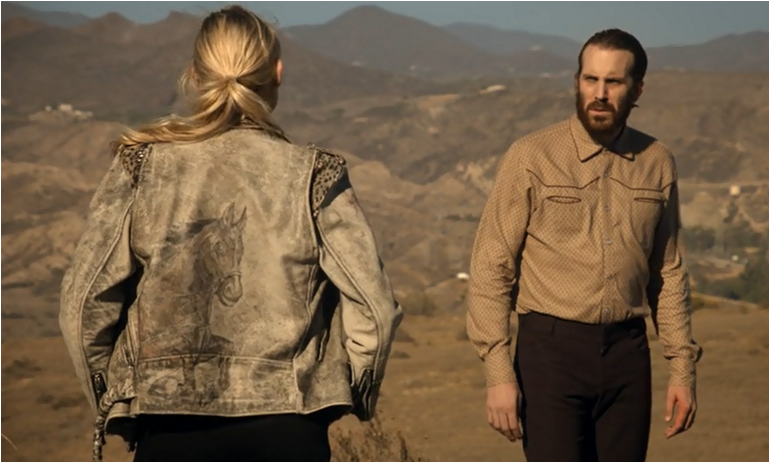 The horse is one of the more obvious details, as is the leopard print on the shoulders and this is all down to costume designer Anna Terrazas who modified a leather jacket that was found in a Los Angeles vintage store. These changes include aging and distressing the piece to make it look well worn. The backstory of the jacket is that it belonged to Sonya’s murdered sister and Terrazas explains that as a piece of clothing it “doesn’t make sense for what she does as a detective or who she is, but the whole idea is that it has sentimental value and is worn in memory of her sister.” This process wasn’t a solo one and Terrazas worked with a team to create this costuming centerpiece and this is evident by how many different details there are. The horse isn’t a mystery as Sonya’s sister loved horses but other details like the different tiger imagery, the faded star and the duct tape are more ambiguous. There was great distress from Sonya in the penultimate episode when she found out that her sister’s Bronco was beyond repair and she mourned this as if she had lost her sister all over again. It doesn’t help that her replacement car doesn’t have a tape deck. Marco mirrored this behavior as he wore the hoodie of his dead son Gus and slept in his bed to preserve the memory of him. Anna Terrazas explains that Sonya is a “very uniform person and does the same routine every day” and this is reflected in the rest of what she wears. The jacket is very much part of her daily wardrobe and it’s easily the most flamboyant thing in her wardrobe as everything else is in basic neutral tones; there are no bold colors here. In one way this is similar to how I would describe Scandal’s Olivia Pope’s costuming but the big difference here is their jobs and what image they need to portray. Everything about Sonya’s clothes screams function as she wears shirts in white, grey, black and light blue, always pants and flat shoes. Sonya is not dressing up for anyone. Steven Linder is socially awkward in his mannerisms and the way he speaks but he also takes pride in how he dresses even if his facial hair is a tad on the unruly side. Linder believes that he has a calling to save young women and his is one of the stranger aspects of The Bridge. He mumbles but he also tries to present himself in a manner which will make his rescue missions less scary – cast your mind back to the first episode and it is clear that he can be a foreboding figure. The iron that he uses to press his shirts also became a murder weapon as he was attacked in his own home, serving a purpose that the manufacturer did not intend. When the serial killer story took over the middle part of the season, Linder was pushed to the sides and while we know why he thinks he has this calling there is also much about him that is still a mystery. What he did last week was act as a conduit between Sonya and Marco; giving the pair a reason to work together again and to get Marco out of his period of despair. Oh and Steven Linder will totally wear his best suit to make a proposal even if it makes no sense in that kind of heat. Linder is as buttoned up as his shirt and by giving him such a distinct look he stands out even when he doesn’t want to. At the same time as I started The Bridge I was also watching Top of the Lake and it helps a great deal that Thomas M. Wright is playing incredibly different characters in both of these projects. Wright’s Steven Linder mannerisms, speech pattern, costuming and hair style show no similarities to Top of the Lake’s Johnno; as viewer this helps with the whiplash that can occur when one actor features in two distinct worlds and I would say that Wright has been one of the breakout stars of the year. New FX drama The Bridge debuts tomorrow night (July 10) and Diane Kruger looks stunning on the red carpet in LA yesterday in a sheer green, black and grey Jonathan Saunders gown (accompanied by the always wonderful Joshua Jackson – someone give him a show please). 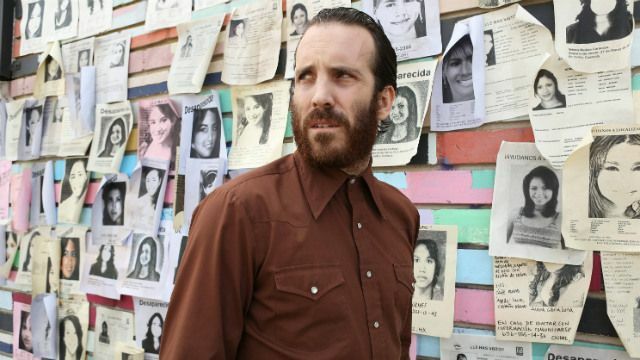 Kruger is playing Detective Sonya Cross, a member of the El Paso Police Department and she has to team up with Marco Ruiz (played by Demián Bichir), a Mexican officer after a body is found on either side of the border. The Bridge is an adaptation of Broen; a Danish/Swedish venture and one of my favorite shows of last year with Saga Noren (the Sonya Cross of Broen) following in the footsteps of the female leads of Borgen and Forbrydelsen as they are some of the best written and most interesting female characters on TV. So while I will try to spare you from too many comparisons between the two and despite having been burnt before with an adaptation of a Scandinavian project, I am cautiously optimistic for this version. Kruger’s character Cross has Asperger’s syndrome (this isn’t explicitly labelled in either Broen or The Bridge but it is clear that Saga and Sonya are on the spectrum) and this is one of the many challenges that will complicate her relationship with Ruiz. Recently Diane Kruger spoke about her decision to do this TV project saying “From Mad Men, to Homeland, to Robin Wright in House of Cards, those female parts are so well-written and unafraid. It seems to me that they thrive and the audiences are looking for characters like that. It’s very exciting for women in general. I’ve never been offered an in-depth character like this in movies.” One of the benefits of TV is that you have a much longer period to develop a character versus the two and a half hours or so that you have to do it on film, so it’s not surprising that Kruger gives this as a reason. It also helps that TV is no longer seen as a step back and there are so many exciting and interesting roles on TV that appeal to those who have mostly stuck to film acting (Kruger does have an uncredited appearance in an episode of Fringe). Are you looking forward to The Bridge?